Kim Kardashian wasn't kidding when she said Kanye West was a fan of Seth Rogen and James Franco. 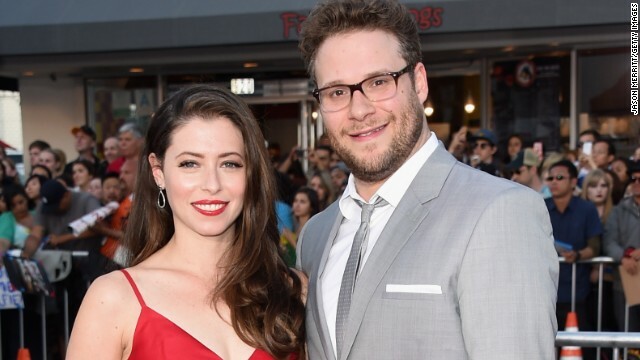 According to Rogen, the rapper even invited the two actors to his wedding. Rogen and Franco parodied West's music video for "Bound 2" earlier this year, and, aside from creating a far preferable version of the clip, apparently also won the devotion of the Chicago star. On "Ellen" Thursday, Rogen said that he and Franco got a call from West with a grand idea for their attendance. "He said he was thinking it might be funny if he performed it at the wedding and we came out on a motorcycle," Rogen said. But since no one could quite envision how to make it humorous, "thank God it was realized it might not be the best idea," the comedic actor continued. His hesitation wasn't because he didn't want to participate, because "if he wanted me there I would've been there naked, with a shirt off, however he wanted me," Rogen said. "On a motorcycle doing whatever he needed. Because I'm a fan; that's just as a fan."